Australia’s own George Miller has made Happy Feet, a brilliant example of environmentalist propaganda aimed squarely at the minds and hearts of the next generation, seemingly in the hope that they will act (where their forebears have refused), to save the planet. As a movie it is charming and fun although a little trite and predictable in places, but as an educational tool on behalf of those who believe that humankind will be the death of all non-human Earth-bound life, it is breathtaking. 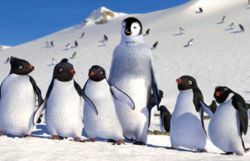 In an American box office seemingly obsessed with penguins, it is ironic that both March of the Penguins (US$77.5 million) and Happy Feet (US$41.5 million opening weekend) were made elsewhere (but used American voices to keep everyone happy) – Australian George Miller directing the locally produced latter. Animal Logic in Sydney (in association with Kennedy Miller) have produced an animated film that is astonishing in its realistic appearance and wonderful to watch. The landscape visuals are remarkable for their lifelike colour and the combination of real life and animated components works brilliantly. The penguins themselves are wonderfully realised. With singing and dancing as promised in the trailer, kids will love the cute little creatures, and it is in this way that Miller clearly hopes to win their hearts. As the ‘aliens’ who are responsible for the decrease in available fish, we come off fairly badly in Happy Feet, although that is hardly surprising. It remains to be seen, however, whether the drawn-out story will have children’s minds wandering rather than absorbing. Their attention is sure to be captured, however, by the singing colony of Emperors and perhaps even moreso when the hero Mumble (Elijah Wood) stumbles across Robin Williams and his buddies as a bizarre group of Adelie penguin ‘Amigos’ – it is only when Williams appears that proceedings become laugh-out-loud hilarious. Aside from the political aspects, the natural charm of the characters and the absolutely brilliant animation, the plot leaves much to be desired. Straightforward and unchallenging, this is yet another example of a children’s movie that asks too little of its audience. Summarised in four phrases: penguin doesn’t fit in, penguin finds others who accept him as he is, penguin becomes hero by staying true to himself, penguin is welcomed back among his own kind. It is basic and predictable, and perhaps the animation and concept were worthy of something more. The final message in this political announcement is also somewhat unclear. In succeeding in drawing human attention to the plight of the penguins, Mumble saves the day. And yet, had he not been a dancing penguin, the film seems to suggest we would not have cared. This may have been Miller’s point all along – that it is only the extraordinary that will make people concerned about the environment – although this subtlety may be lost on a younger audience whom Miller seems to have been trying to convince that we have a responsibility to behave better for the sake of all (including the non-dancing, stock-standard) non-human life. While Happy Feet is at times ground-breaking in its animation, and its characters and their hijinks will certainly entertain, it is not a perfect film. As a prod at the collective sense of environmental conscience, it is likely to win the hearts of many of its target audience of pre-teens. In spite of the rave reviews it has received, it’s just not Citizen Kane. This entry was posted in Film Reviews and tagged Animation, Comedy by Mark Lavercombe. Bookmark the permalink. 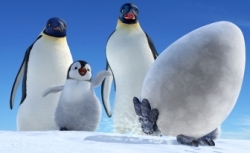 Though a US co-production, Happy Feet has not only been the most expensive Australian film ever made, it apparently also experienced the highest grossing opening weekend of any Aussie film ever. Cinemas are littered every year with dozens of CGI animated kids’ movies, so much so that it’s hard to get excited about them anymore. Monster House was a pleasant surprise earlier in 2006, but with Happy Feet we truly have a reason to rejoice. The animation is superb. This is easily the best CGI work we’ve seen in the last five years or so, and lifts the bar for Disney, Pixar et. al. The first five minutes of Happy Feet are spellbinding, reminding me more of Ben Hur rather than just another cutesy animal flick. The music is brilliant also, the ‘mega-mix’ medley technique in fact very reminiscent of Moulin Rouge. Happy Feet certainly packs an emotional punch. I was pummelled with its teary message of hope and finger pointing with regards to the impact humans have on the natural world. One wonders if it’s really fair to heap the blame upon an audience so young, but then again maybe they are the only people who will listen. Also, to be honest it isn’t a new phenomenon – we did kill Bambi’s mum back in the 40s and leave those huskies in Antarctica (Nankyoku monogatar) in 1983 – but all the same it’s pretty full on. This is the single most forcefully emotive film I’ve seen in a long while, and whilst the specifics aren’t really too clear, the message seems to be ‘leave them alone’. And watching a film like this it’s hard to imagine that anyone would not want the best for these penguins. Happy Feet is also an incredible adventure. The scope the animation allows is incredible – chases underwater, marches across the frozen wastes – this is what computer graphic imagery was born to do. There are a few moments that could have been trimmed and there’s about two songs too many. It’s also a little disappointing to see that the main characters have to have American accents (especially since little Mumble’s parents are voiced by Aussies Nicole Kidman and Hugh Jackman), but I’m always in two minds about such decisions. Happy Feet clearly has a global audience in mind, and the sad fact is that generally speaking we expect to hear American voices. George Miller’s film had a pretty powerful effect on me, and even if I’m not entirely comfortable with Happy Feet on a couple of aspects, it certainly is an amazing achievement.